This humidifier offers many benefits to your health and environment, making your home a more comfortable, healthy and comfortable place throughout the year. 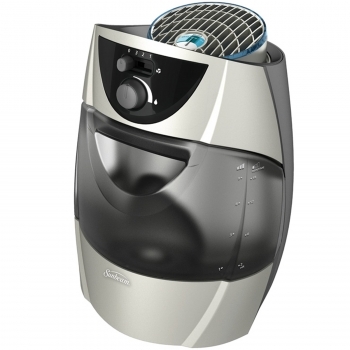 Purified Mist: Water is passed through a filter to ensure clean, fresh mist is dispersed into the air for maximum comfort and a pure, healthy environment. FilterCheck Monitor: Hassle-free maintenance. The convenient monitor lets you know when it's time to replace the filter. Run Time Scale:No second guessing. Located on the side of the tank, the scale lets you know exactly how long your humidifier will run until the tank is empty. Adjustable Humisdistat: With one turn, you can change the rate the humidity is dispersed into the room. With variable speed options, you will enjoy maximum personal comfort. Microbial Protection: Microban antimicrobial protection is infused into the plastics to help prevent the growth of bacteria that can cause stains and odors or adversely affect performance.